What are typical daily calorie requirements? Most of us are aware that different food products contain different amounts of calories. A product high in calories will give your body more energy. Your body needs approximately 2,000 calories per day if you are female and 2,500 if you are male. If your calorie intake exceeds this requirement and you do not use up the calories, no matter what food source the calories have come from, the body will store the excess as fat. Products that are high in fat are usually highest in calories. How do I get the most from my calories? To prevent your body having excess energy to store as fat, it is important to monitor your calorie intake and expenditure. To lose weight successfully, the key is to eat less foods that are high in calories and increase your physical activity level. If you choose your foods more carefully and select those that are low in calories, you can eat more food for the same amount of calories as what you would get from a single high calorie product. Smarter choices over which carbohydrate products you eat (low GI) can also make you feel fuller, so you don't need to eat as much - which in turn means consuming fewer calories. 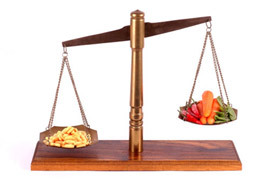 The less energy dense a food product is means it has fewer calories in per gram. Conversely the more energy dense a food product is, the more calories it has per gram. Foods classed as having a high energy density include sweet and fatty foods; this means for just a small amount you eat you are getting an lot of calories. Foods classed as having a low energy density include fruit and vegetables, protein rich foods and low fat dairy products. These foods have less calories in per gram and you can generally eat much more and still not reach the amount of calories found in a small portion of energy dense foods. Nutracheck provides a Calorie Calculator service to find foods lower in calories so you don't have to compare lots of food labels. By using Food Swap online, you can simply enter the information of the product you want to eat or drink, and Nutracheck will suggest a product lower in calories or fat.